Kriti Sanon starts the new year by visiting an orphanage and spending quality time with the children. Kriti Sanon had a gala time with children as they danced their heart out on the chartbuster songs of Kriti ‘Aao Kabhi Haveli Pe’ and ‘Sweety Tera Drama’. The children had also prepared performances for the actress. 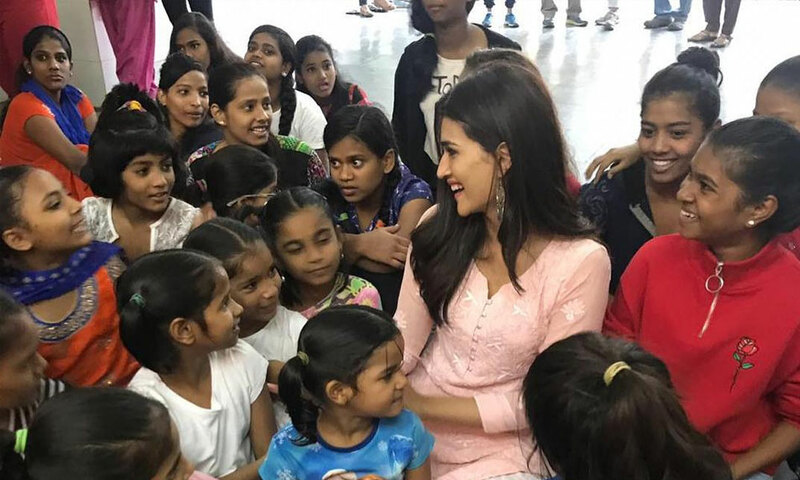 Apart from the fun interaction, Kriti spoke to children upon the importance of education and guided them ahead for their career and the children were thoroughly motivated. The actress herself is an engineer before she pursued acting. Kriti has a huge fanbase in the children and at the orphanage, she came across a young fan of her who is a big fan of the actress and when she met her the young fan got emotional and was absolutely delighted to see the actress. The children had also prepared performances for Kriti which the actress thoroughly enjoyed. Kriti Sanon has chock -a- block schedule ahead with her 4 films releasing this year yet she took out some time and met her young fans.